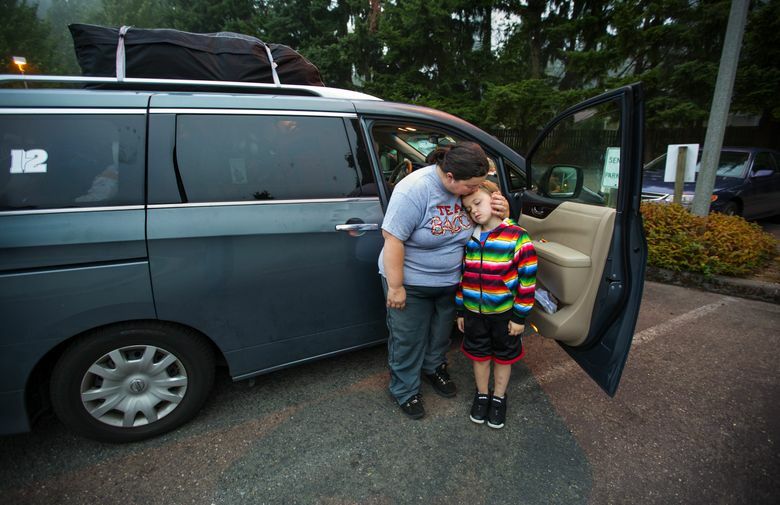 A Kirkland church has opened its parking lot to homeless families living in their cars. It’s a low-cost lifeline but has only been duplicated a handful of times. This is what it takes to give a homeless person living in a car a safe place to sleep at night: a parking lot and a port-a-potty. For the past four years, the members of Lake Washington United Methodist Church in Kirkland have opened their church parking lot overnight to people who had nowhere else to go. The program has evolved, been reorganized, even scaled back, but there are now about 30 cars and vans parked outside the church, many with young children. Pastor Kelly Dahlman-Oeth estimates the program costs about $5,000 to $6,000 a year, mostly to rent the portable toilet and pay higher utility bills. Still, the success of the Kirkland church program has not translated into many other churches opening their own parking lots to the homeless. A woman with her 7-year-old son puts her many worries to rest each night in a van outside the church. A family of five spent six months in their vehicle in the parking lot, and now works to pay back the church’s generosity. Read more. But as the crisis in affordable housing and homelessness continues, advocates are asking if cities can copy a successful model from Eugene, Ore., and open some city-owned lots and those of willing businesses to provide more safe places for people whose last possessions may be their cars and what’s inside. “Many city-owned parking lots are empty at night. It’s really criminal that they’re not being used to get more people out of harm’s way,” said the Rev. Bill Kirlin-Hackett, director of the Interfaith Task Force on Homelessness. The Seattle Road to Housing Program, for example, started in 2012 with six parking spots at one church. Since then, only four other churches have signed on, for a total of 12 spaces. The city has spent more than $500,000 to provide outreach and case management for several hundred people living in their vehicles and has found housing for about 100, according to the city. But it hasn’t given the vast majority of people sleeping in cars and RVs on city streets a safe place to park at night. The One Night Count of the Homeless in January found almost 4,000 people in King County living outside without shelter. More than 1,100 were people sleeping in their vans, cars and RVs. What was considered a crisis in Ballard in 2011 has spread to other Seattle neighborhoods. This summer, Magnolia residents blamed a spurt of illegal activity, including mail theft, on those who had moved their cars into the neighborhood. There were reports of garbage, human waste and campfires on the sidewalks. Police in July also responded to neighbor complaints of homeless people sleeping in vans and RVs along Northlake Way near Lake Union. While homeless advocates say the problem usually involved one or two bad actors, the response from the city has often been to post ”no parking” signs or limit to 72 hours the time a vehicle can remain in one place. That’s meant people receive tickets they can’t pay, or lose their only shelter when their vehicles are impounded. “Many, many cities are criminalizing people for staying in their cars, which is usually a last resort for folks who have lost their housing,” said Megan Hustings, interim director of the National Coalition for the Homeless in Washington, D.C.
Eugene’s overnight parking program goes back 14 years. It pays St. Vincent de Paul of Lane County about $90,000 a year for intake, case management, portable toilets and trash collection at city-owned and private lots, some for single men, others for women and families, for a total of about 60 spaces. The charity is also the first responder to police calls involving people living in their vehicles. William Wise, director of St. Vincent’s First Place Family Center, said the program has saved Eugene about $300,000 a year because police are called less often. “The police didn’t like having to write a $500 ticket to a mom with three kids in a beat-up van who had nowhere else to go,” he said. Observers say the Seattle program hasn’t taken off for a number of reasons. Many churches already provide overnight shelter or regular meals to the homeless. Many congregations are shrinking and have limited budgets. Many have no parking lots or only very small ones, said Sola Plumacher, acting director of the community support and assistance division of Seattle’s Human Services Department. And she said some congregations don’t feel adequately prepared to deal with people who may have great needs. Kirkland’s Lake Washington United Methodist started its Safe Parking Program in 2011 with limited hours and no access to the church. 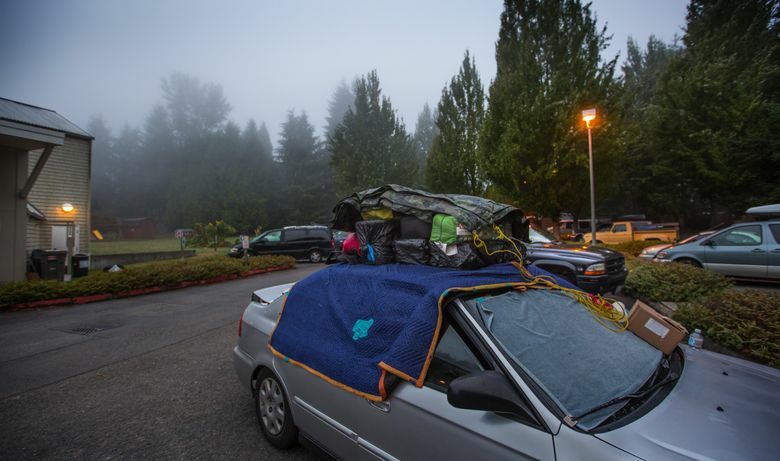 Car campers could park after 9 p.m. and had to leave by 7 a.m. the next morning. Karina O’Malley, one of the coordinators, said the one or two drivers who showed up told them it was kind of creepy to be the only car in an empty parking lot. They’d take their chances with the Wal-Mart or Safeway parking lots, she recalled. Volunteers are also welcomed. The church would like to raise money to add showers and laundry facilities for the homeless people parking there, and one day provide affordable housing. Then, in November 2012, about 65 homeless people expelled in a leadership dispute from Tent City 4 turned to the church for emergency shelter. Church members voted to allow them to stay inside the building until provisions such as tents, sleeping bags and food could be collected. “It was like a flood or a tornado. Suddenly there were a whole bunch of people with nothing but their clothes and nowhere to go,” said O’Malley, who is also a longtime board member of The Sophia Way, a Bellevue women’s shelter. What became a new tent encampment, Camp Unity, eventually moved to another location, but the congregation continued to allow encampment members and the parking-lot families wide access to the church. Over time, O’Malley said the constant presence of homeless people overwhelmed the congregation. “We went from being a church that served homeless people to being a shelter that sometimes had church,” O’Malley said. Now the women and families admitted to the program sleep in their vehicles. A host from the church unlocks the building at 6:30 a.m. each weekday so campers can use the bathroom and kitchen. As long as church staff are present, the building is open during the day. Another host supervises the building from 7 to 9 p.m. as people get ready for bed. “It’s really hard to brush your teeth or get ready for work in a port-a-potty,” said Dahlman-Oeth. The guests, as the church calls them, can participate in its activities but aren’t required to do so. The church runs a background check on anyone looking for a place to park and excludes anyone with a violent felony on their record or a recent domestic violence incident. Over the program’s four years, the pastor said, police have been called twice. Dahlman-Oeth said the church’s parking program grows out of its Christian faith and the call to walk alongside the poor. But he cautions other religious groups that there can be downsides. 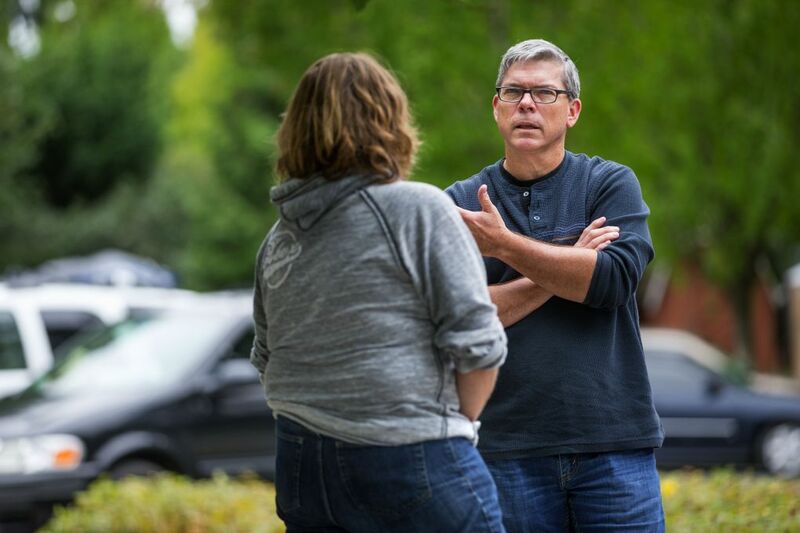 Lake Washington lost longtime members who didn’t want to navigate a parking lot full of strangers or face reminders of a family member’s struggle with addiction or mental illness. Neighbors complained about noise and people peering into their yards. “It’s messy,” the pastor says. Spoons have vanished from the kitchen, toilet paper from the bathroom. Litter is sometimes scattered over the parking lot. Utility costs and wear and tear on the building have gone up. There is also a risk, Dahlman-Oeth warns, of church members having their lives transformed. “They learn they don’t have to hold on so tightly to their possessions, their education, their ability to plan for the future. These folks will share so much more,” he said. O’Malley said that when she speaks to religious groups considering a parking program, she tells them to start small, be useful and see what feels comfortable. She said that the flood, the tornado leaving hundreds of people homeless in its wake hasn’t subsided. “This is what happens when you realize there is a disaster going on all the time,” she said.